Vincent Aboubakar was the hero with a brilliant late goal, firing Cameroon to a dramatic 2-1 victory over Egypt in Libreville and their fifth Africa Cup of Nations title. Aboubakar replaced Robert Ndip Tambe at half-time, with Hugo Broos' side a goal down, and went on to secure the Indomitable Lions' first championship since 2002 with a brilliant individual effort in the 88th minute. The triumph will be made all the sweeter after seven players, including Liverpool and West Brom defenders Joel Matip and Allan Nyom, snubbed the chance to represent their country in Gabon. Egypt took the lead in the first half when Mohamed Elneny, back in the starting line-up after missing the last two matches with a calf injury, was the beneficiary of some woeful goalkeeping from Fabrice Ondoa. However, Cameroon showed renewed vigour after the restart and they were rewarded when substitute Nicolas N'Koulou headed home in the 59th minute. Broos' men continued to push and Aboubakar popped up with the winner in the 88th minute, ending seven-time champions Egypt's 24-match unbeaten AFCON run and securing Cameroon a place at the 2017 Confederations Cup in Russia. 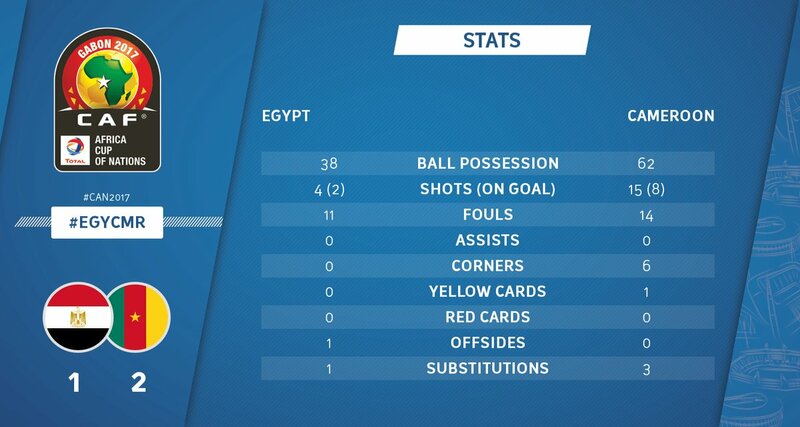 The team stats above posted by CAF on their official Twitter handle shows how both team fared during the 90mins battle. 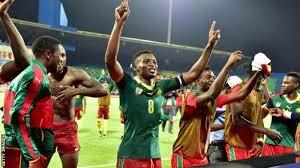 It's obvious Cameroon had the upper hand and its no surprise that the are Champions today and they deserve it. We wish them good luck when they leave to partake in the 2017 Confederations Cup in Russia.